This is really a return a style we haven’t seen from del Toro since his Spanish-language The Devil’s Backbone, still probably my favorite of his films, back in 2001. This is most immediately apparent in the look of the ghosts—there’s an ethereal quality to them, almost as if they’re swimming, dissolving in the air around them. 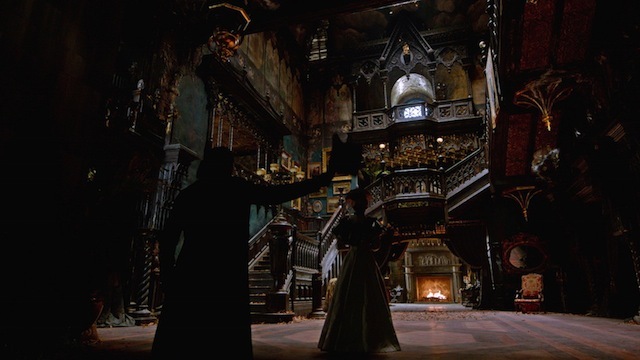 But it also extends to the overall mood and aesthetic, and while Crimson Peak is a much more visually complex film, a brighter film with an intricate color scheme, del Toro borrows a great deal from himself in this arena. The ghosts are harbingers in this world of disheveled nobility, warnings of dangers ahead instead of threats. Edith (Mia Wasikowska, who looks more pale and spectral than any of the lingering spirits, bordering on angelic) has seen ghosts all of her life, though she is not haunted. When she marries Thomas Sharpe (Tom Hiddleston), a titled British lord who has fallen on hard times, she moves across the Atlantic and is ensconced in his isolated estate, Allerdale Hall, with his eerie sister Lucille (a dark-haired Jessica Chastain, equally as pale as Wasikowska, and far more sinister and terrifying than any of the ghosts). Something is not right, and Edith must get to the bottom of it, even as betrayal is afoot and her life hangs in the balance. Though it may technically qualify as a horror movie, in reality, Crimson Peak isn’t particularly frightening. Del Toro is all about tension and mood and using the atmosphere to squeeze the breath from your lungs without you even realizing what’s going on. There are no jump scares, just constant amplification of pressure. In that regard it is more of a thriller than anything else. The rural estate is a decaying monolith of a mansion—black and rotten, the ceiling has long since worn away, letting it snow indoors, and the house is literally sinking into the earth, a blood-red mixture of clay that oozes through up through the floorboards and drips down the walls on the lower levels. The house bleeds and breathes, and when the snow falls the red clay seeps into the drifts, giving the appearance that the mountaintop is bleeding, as if the house is a gaping, unnatural wound that just won’t heal. The vivid color scheme, rich blues and warm reds offset by black shadows, and stylistic flourishes like iris wipes, give Crimson Peak the feel of a bygone era, like a Hammer film on a much larger scale, or Mario Bava with more polish. There is no sarcasm, no knowing nods or mockery or tongue-in-cheek arrogance. Del Toro plays is all with an earnest streak, and though there are lots of long, heaving looks, and embellishments that could easily plays as soap opera level farce, there’s a swooning sincere delight to the whole things. Much like how his Pacific Rim feels like a kid playing with action figures, smashing them together with glee, this has the feeling of one playing with dolls, staging an elaborate drama. Within these genre trappings, Edith pieces together the larger mystery, unraveling motivations, and unearthing horrific secrets. To be honest, nothing particularly shocking happens—what is supposed to be the big, appalling reveal, among others, is rather obvious—but that doesn’t matter. Crimson Peak unspools in a sumptuous, languid fashion, though there are a few moments of startling violence included as punctuation. The surprises of Crimson Peak come from the character and emotion, and Wasikowska, Hiddleston, and Chastain—it’s largely a three-hander between this trio, at least the most consequential bits—are true to the societal restraints of their aristocratic positions. But within these confines, within the tropes of melodrama, all three find ways to betray the depth of their feelings, despite cold, stoic exteriors. In the constraints and limitations on what they can and can’t say or do, there are flashes of Douglas Sirk-style criticisms of caste and class. Charlie Hunnam is flat and cardboard, but in his defense, that’s the character, and del Toro, who also wrote the script, uses that. He’s the handsome, heroic man, come to save the damsel in distress, though the director subverts these types. He never lets Edith become a victim, and that undermines some of the white knight, male savior elements that the character would otherwise embody in more traditional narratives. 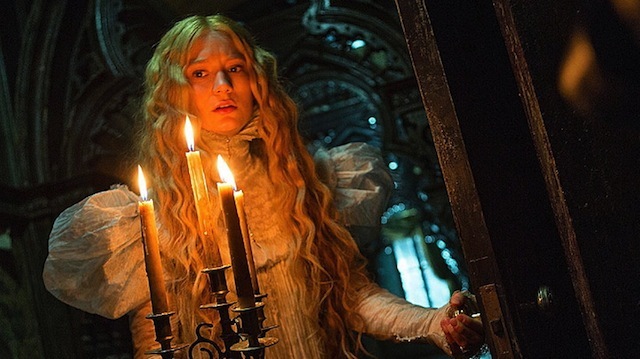 Crimson Peak is a movie that you fall into, more like an experience than a simple film. You luxuriate in the setting, part gritty and real, part dreamy fantasy; get caught up in the mystery and duplicity; and feel the pains and passions deeply. Admittedly, as enrapturing as Crimson Peak eventually becomes, it takes a while to get there. The first act, where Thomas courts Edith in her home of Buffalo, New York, is where the rote nature of the story is a liability. Del Toro is eventually able to twist this tired tale into what it becomes, undermining expectations, but the whole dreamer-falling-for-the mysterious-stranger introduction runs longer than it needs. It’s not until they get to Allerdale Hall, roughly a third of the way through the movie, that Crimson Peak truly finds its flow.